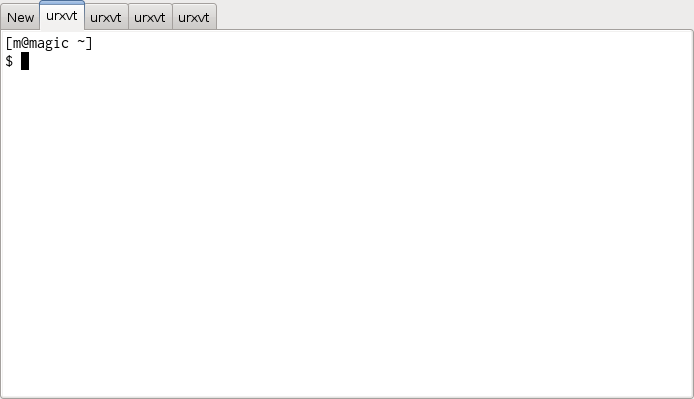 i m currently using openbox as a standalone window manager and am using the rxvt-unicode (urxvt) terminal program. in fact i m using the urxvt daemon (urxvtd) and simply launching the urxvt client (urxvtc) which attaches itself to the daemon. this greatly reduces memory requirement. i have a low end laptop IBM Thinkpad R51 (238MB ram/ 1.4GHz Pentium M processor) and i love to use firefox which means i must conserve as much memory as possible. to open a new tab simply hit Shift+DownArrow and to move between tabs use Shift+LeftArrow and Shift+RightArrow. this works great but looks ugly in my opinion. now let us have a dekko at the urxvt-tabbed version which is gtk2 based. that will also install the urxvt-tabbed version. Can’t locate Gtk2.pm in @INC (@INC contains: /usr/lib/perl5/site_perl/5.10.1 /usr/share/perl5/site_perl/5.10.1 /usr/lib/perl5/vendor_perl /usr/share/perl5/vendor_perl /usr/share/perl5/vendor_perl /usr/lib/perl5/core_perl /usr/share/perl5/core_perl /usr/lib/perl5/current /usr/lib/perl5/site_perl/current .) at /usr/bin/urxvt-tabbed line 14. BEGIN failed–compilation aborted at /usr/bin/urxvt-tabbed line 14.
hmmmm… this was interesting … why not indeed? you r good to go! the good thing about tmux over screen is that the info bar at the bottom is a great help … it also displays date and time which i was missing as i have no panels installed in openbox nor am i using conky. remember that urxvt respects .Xdefaults NOT .Xresources. urxvt respects .Xresources if you launch “xrdb .Xresources” at startup. didn’t try with .Xdefaults. running xrdb you can instantly apply your changes to urxvt, without logging out. Thanks for your comment. I am not aware of ‘tabber’ which you mentioned in your comment. Did you meant ‘tmux’? In any case tmux has some mouse support — you can select windows and panes using mouse, you may resize panes using mouse etc. Also this project is being actively developed so ‘mouse friendly’ might increase if the demand for it goes up.